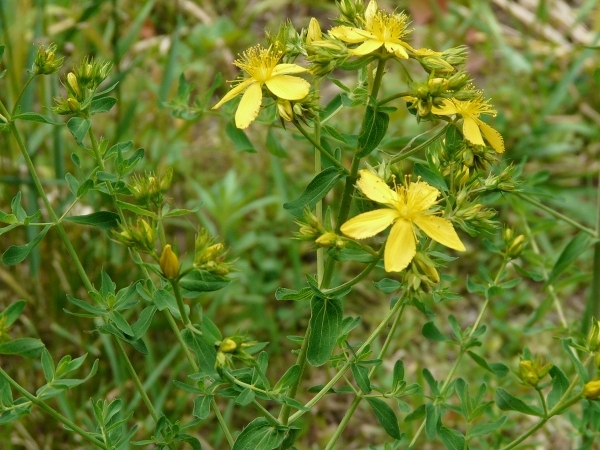 St. John's Wort is a herb that booms mid June to July, around the time of John the Baptist saint's day. Thus the name of the herb. Modern medicine markets this herb mainly as an anti-depressant but it has actually many other beneficial properties. As an oil it eases swelling, bruises, muscle aches and helps in the treatment of many skin disorders. The herb might be growing just in your backyard if you would not mow it over every time. If you see it growing somewhere just don't run it over with the lawn mower and you will be able to make some really good St. John's Wort Oil. Just like any herb it does does not like lawn fertilizer at all and grows best in a sunny spot on mineral rich soil. It's sometimes a bit difficult to recognize the herb between grass, especially when the plant is still small and has no flowers yet. 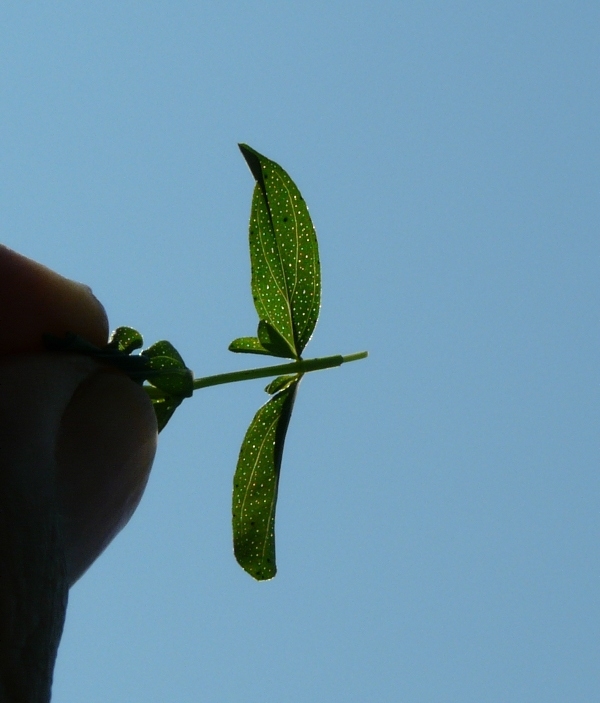 One way to identify it is to hold a leaf against the sun light and you will see white spots. Those little glands containing essential oils. 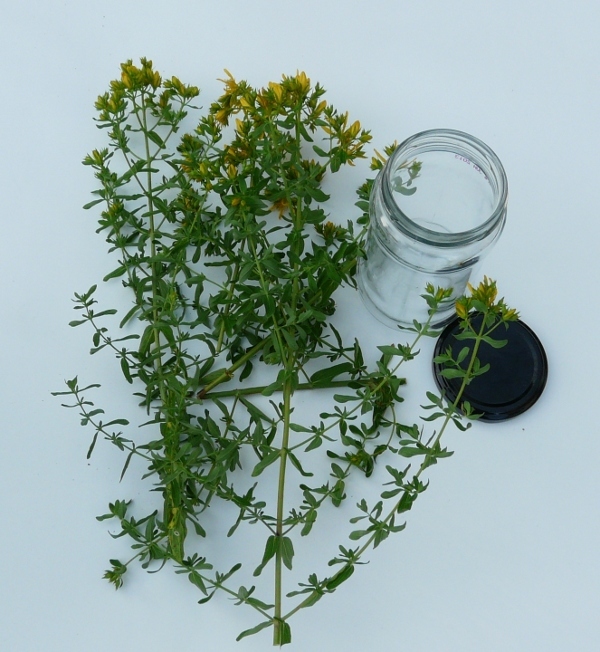 The red St-John's wort oil must be prepared when the herb is flowering (around June-July). Use a bigger (250-500ml) jar. The jar should be transparent (not green or brown) and have a lid. 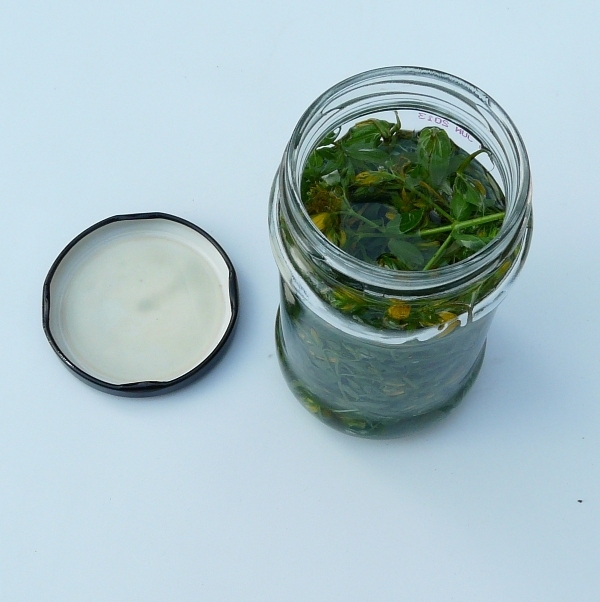 Cut the St-John's wort into small pieces such that it can be inserted into the jar. We use both the leaf and the flowers but discard the stem. 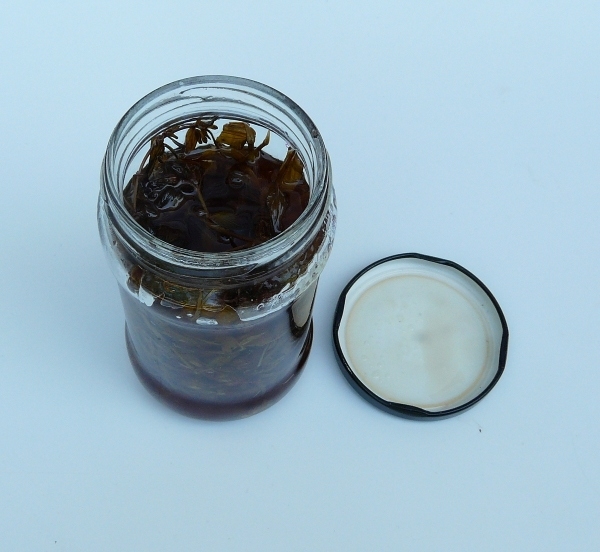 Put as much as possible of St-John's wort into the jar. Add a good quality vegetable oil (I use normally sun flower oil) and put the jar into the full sun (!) for about 2 weeks. It's a red-brown oil when it is ready and then you can fill it into small bottles. This oil soothes and heals inflamed tissue and reduces pain. Don't apply it to a large area before exposing your skin to the sun. St-John's wort makes the skin more sensitive to sun and you can easier get a sun burn.